This step by step diy woodworking project is about gable shed double doors plans. This is PART 3 of the gable storage shed, where I show you how to build the double front door. 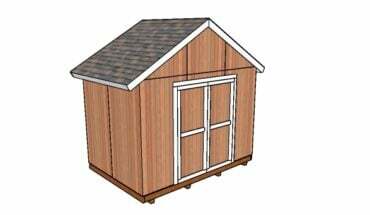 This shed is easy to build and it can accommodate a lawn mower and a few garden tools, as well as boxes. Remember that you need to read the local building codes before starting the construction, so you comply with the legal requirements. See my other shed plans HERE. Build the door from from 2×4 lumber, using pocket holes and 2 1/2″ screws. Align the edges with attention and make sure the corners are square. Add glue to the joints and make sure the edges are aligned. Attach the T1-11 siding sheet to the frame with 1 5/8″ screws. The panels are the pieces that you cut out in the previous steps.